Welcome to PCC266 – sketch challenge with Painted Harvest! Actually, the challenge is with the Paper Craft Crew; I love this week’s sketch, and chose to use the Painted Harvest set. The really great thing about the Painted Harvest set is that there is a whole suite of products that all coordinate! You can Bundle the stamp set with the Leaf Punch, and SAVE 10%, and you can also choose as many of the other products (designer paper, ribbon, embellishments) as you want. I’ll be honest; when I first saw this sketch, I was totally stumped! And seriously intimidated!! But once I decided to use the Painted Autumn Designer Series Paper in my focal area, it all came together quickly after that. I used Chocolate Chip cardstock as my base; I would’ve used Early Espresso, but I’ve run out! The next panel is Soft Sky cardstock, cut to 4″ x 5 1/4″. The Painted Autumn DSP is cut to 2″ x 3″. To create the scalloped piece behind it, I used my Big Shot and Layering Squares Framelits. I die cut one edge of the large scalloped square, and trimmed it down to 1″ x 3″, and layered it behind the DSP with Tear & Tape. To create the leaves, I stamped the small ones from the Jar of Love stamp set in Garden Green. The large leaves are from the Painted Harvest stamp set, inked in Pear Pizzazz and Garden Green. The Big Shot with the Everyday Jars Thinlits was used to die cut the small leaves; the Leaf Punch used for the large leaves. The sentiment is from the retired Wetlands stamp set; stamped in Chocolate Chip ink onto Very Vanilla cardstock. It is die cut with the Stitched Shapes Framelits. The oval behind it is Chocolate Chip cardstock, die cut with the retired Ovals Framelits (I don’t have the Layering Ovals Framelits, but you can use those, if you do). 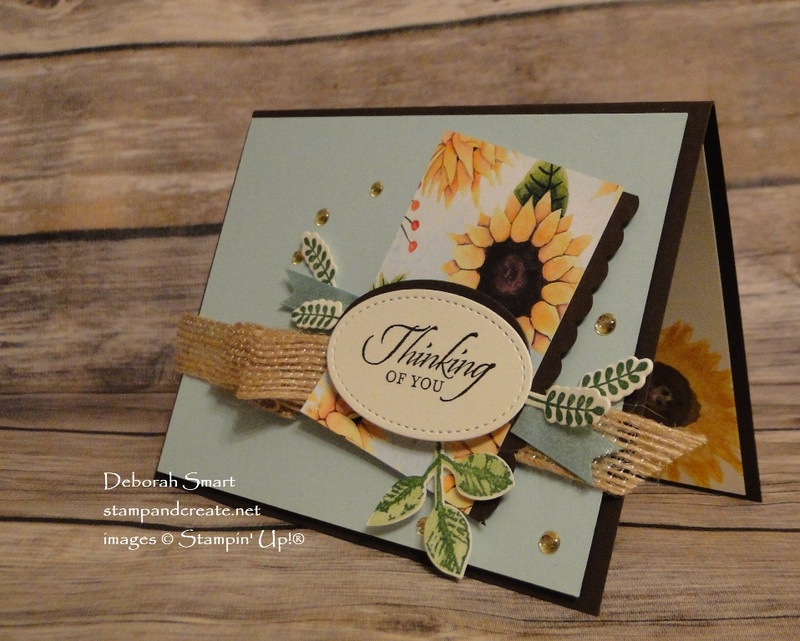 The sentiment and leaves are all layered onto the DSP panel with Stampin’ Dimensionals and Mini Glue Dots. After the layering was done, I attached the panel to the card front with Dimensionals. The Burlap Ribbon is attached with Tear & Tape, and the Shimmer Ribbon in Pool Party is attached with Mini Glue Dots. I haven’t decided what occasion this card will be used for, so I haven’t stamped an inside sentiment yet. I did stamp the flower image from the Painted Harvest set in the lower right corner. For the flower, I stamped the first layer in So Saffron ink, the second layer in Crushed Curry ink, and the middle in Chocolate Chip ink. I’ve just started stamping with this set, so I’m really hoping that it will carry over, after the Holiday catalogue period is finished! You can recreate this card – or create one of your own! Click on the images below, or my signature, to shop at my online store. Join the fun – you may be our next Top Pick!! Check out what the rest of the Design Team have created at our Paper Craft Crew page, grab the link, and link your card. I’m looking forward to see what you create, using this amazing sketch! Remember, you can flip the sketch sideways, backwards or upside down (or all 3! ), just stay with the basic sketch. The rest is up to your imagination! Next Next post: STAMPIN’ BLENDS AVAILABLE NOW! Wow, that is a hard challenge and you did it spectacularly! Beautiful card! This is beautiful, Deborah. I can see why you’re chuffed. 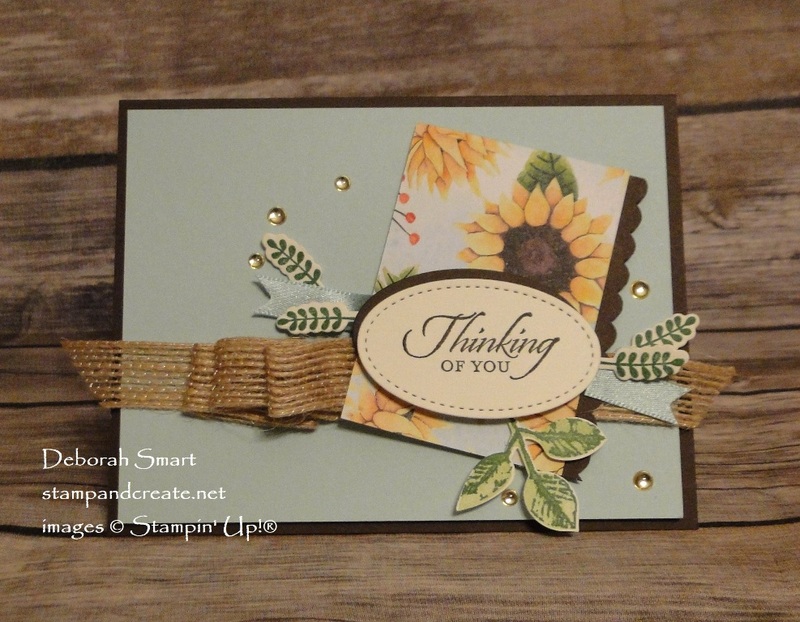 I love the burlap ribbon; it’s perfect for this card.